From 1967 an issue of “Comment” a magazine/ Newsletter produced by the “Universities Branch of The Labour Party Earlsfort Terrace Dublin”. This issue is edited by Ruairi Quinn. There are various articles including the editorial on “Labour and Coalition” , some poetry, a Message from Brendan Corish, an article on development and planning, a piece on Cuba. 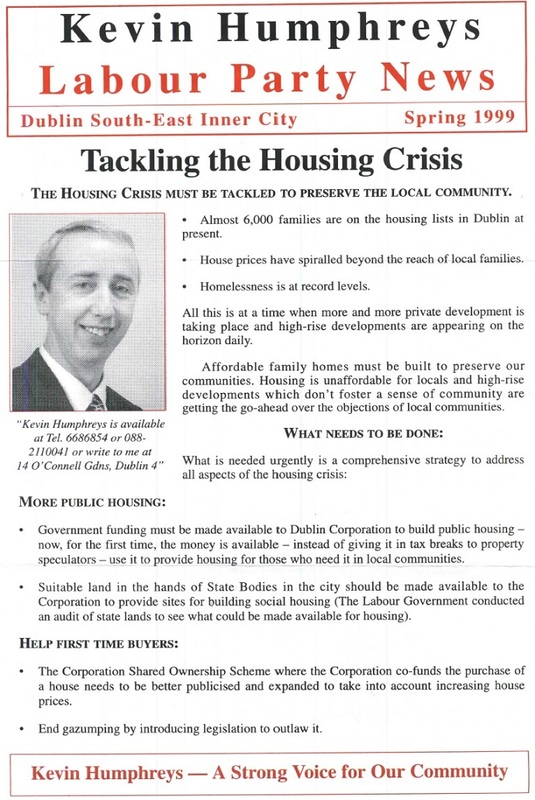 From the 1999 Local Elections a leaflet from Labour South East Inner City candidate Kevin Humphreys on “Tackling The Housing Crisis”. The leaflet outlines the housing crisis and offers various solutions. There is also a message of support from Ruairi Quinn.